Another beautiful Batumi building, the building of the museum is one work of art in itself! 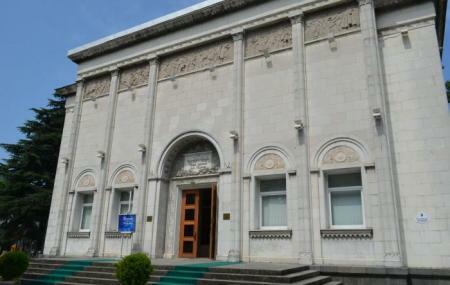 Accommodating, glorious paintings of Georgian as well as foreign artists, the Adjara State Museum has drawings as well as decorative artworks. Most of the artwork is from the 20th-21st century. Art lovers and non-art lovers too can have an insightful time, especially when the weather outside is not its best! With a compact and focused collection, the museum will not occupy a lot of your days’ time, just enough for a quick glance at its 500 odd items. The second floor particularly has some very interesting works. The ground floor is a popular venture of changing exhibits, and you are most likely to come across one, almost any time of the year. The welcoming, warm staff makes a visit to the Adjara State Museum even more nice! Free entry to children under 6 years, homeless children, soldiers, employers of Georgian and Foreign Museums, ICOM members, and I and II category disabled persons. How popular is Museum Of Adjara? People normally club together Holy Mother Virgin Nativity Cathedral and Europe Square while planning their visit to Museum Of Adjara. Very interesting how this small part of a small country can have such a reach history. One can find many interesting historical pieces plus descriptions. Nice to visit even without a guide. It's very nice to see the way they preserved the animals, old wood works and ancient history. It's a peraonal museum, not so big but it worth a visit.